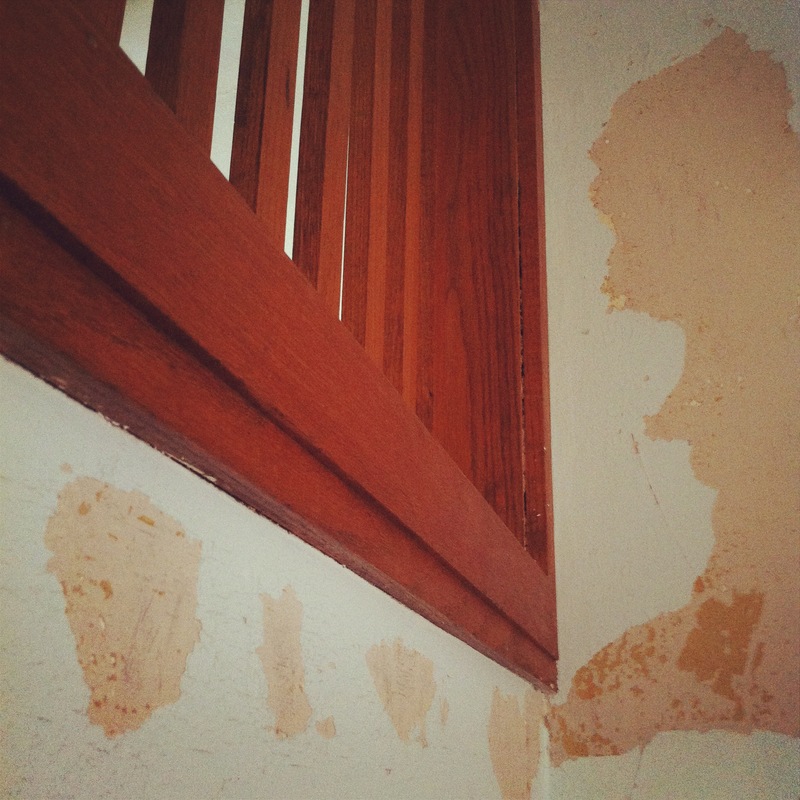 During the hour that Jason was home for lunch today, we not only consumed some leftovers, but also had a consultation with a home repair expert, moved some large pieces of furniture out of our dining room, and added to the growing piles of scraped paint on the dining room floor. It’s part of the never-ending cycle of living in a home that is both old and a bit too small for our family of five. We settle in for a while, comfy and content, but then one day I can’t stop looking at that flaking paint, or we’re tired of waiting to use a bathroom, or we get utterly fed up with the daily clutter and our lack of storage. It’s a straw-that-broke-the-camel’s-back cycle: There’s underlying contentment disrupted by small annoyances that always manage to reach a tipping point—something that puts us over the edge. So we rearrange rooms and paint, we remodel space in the basement, and inevitably we travel to IKEA to find a few pieces of furniture that will add storage, help delineate space, give us a larger worksurface in the kitchen. And then every so often, when all of the small changes don’t add up to a big enough difference, we talk about buying a larger home or building an addition onto ours. We dream, plan, sketch, and keep half an eye out for for-sale signs, before eventually turning back to our smaller, reasonable improvements. How can I love AND be annoyed this much by a single structure made of wood and plaster, with old, wavy glass views to the world outside?!? Our relationships with our homes are clearly complicated. For most of us, it isn’t just a matter of practicality—making a list of the square footage and number of bathrooms you think you need in a house and then finding one that fits. Our real connection to our homes isn’t built with wood so much as it is built on things that are less tactile, and harder to nail down. Emotions, memories, symbolism, and even some inner vision of what could be rule how we feel about this place where we sleep and eat, talk and cry. Even though the house itself isn’t a living, emoting creature, the relationship between me and my house certainly seems to breathe and change. Like with any relationship, there is give and take, compromise, and sacrifice. Sometimes what people see in my home is simply the product of things like budgets, time, and old-house bad luck, but still, a house always says something about the people and priorities that live there. Our homes are iconic. At times, the delineation between me and my house seems especially fuzzy, whether I’m seeing the clutter and signs of age, or at the warmth and light, the places that represent thought and reflection and those that are designed for conversation and connection. My home is like me in so many ways—it’s not perfect and needs work, but it also has value that runs deep beneath the surface. So, for now Jason and I will continue to prod and poke, scrape and shift with this house. Sometimes I just wish it could be easy, that our home could somehow magically be right, but I am trying to remember and respect that my relationship with home is just like any relationship: deserving of care and attention, patience and work. So much goodness here, Kristin. I love my home too, despite the leaky kitchen faucet and the ugly linoleum kitchen floor and the occasional drafts. (Perhaps my relationship is a little different since I’m a renter, too.) Our homes are iconic – they are icons of who we are, and perhaps who we’d like to be. And they are refuges, and spaces for dreaming, and living, and loving. Much to say here, as always you provoke good thoughts. I like this: “the people and priorities that live there.” And indeed we can discern what matters to others by how they define their spaces. And, yes there are times when my own person, my physical being offends my emotional or psychic being. And vice versa. But it where I am, this skin in which I live. We’d do well to both embrace our homes and our selves for the deep stories they tell. You are putting words to the debate at our house for the past two years. Move/remodel/move/remodel/move/remodel? As you know, we made a decision finally! Great post. I think our homes take on a human quality because of the human-like actions they seem to do. They shelter us from the outdoors and protect us from intruders. They offer us rest and respite. They’re basically a container for the emotions and life that happens within. Katie, I really like how you said this: “they are icons of who we are, and perhaps who we’d like to be.” There are many aspects of my home that remind me, daily, who I am and who I’m striving to be. Jen, the priorities part made me think of this: The people I bought my home from didn’t have a dining room set up—instead, both front rooms were filled with couches and toys, big TVs and computers. Just that shift, having a whole room that’s devoted to sitting down and eating together, says something, doesn’t it? Anyway I love what you said about embracing our homes and ourselves, good and bad, for the stories they tell. Beautiful. Lisa, yes, I can imagine this resonates with you! And even though you’ve made the decision, I’m sure the remodeling process itself is filled with a different kind of complexity—the finished product will have its own stories to tell. I hope you enjoy them! The Modern Gal, that’s such an interesting way to look at it! I’m sure you’re right—the almost human-to-human affection we feel towards our homes has a lot to do with the human-like qualities they represent to us. What is interesting to me is the reverse process that occurs when you divorce. You have to abandon the entire concept of “home”, and all that it represents that you so eloquently described here, to a pile of timber and paint that needs to be reverted to cold, hard cash.